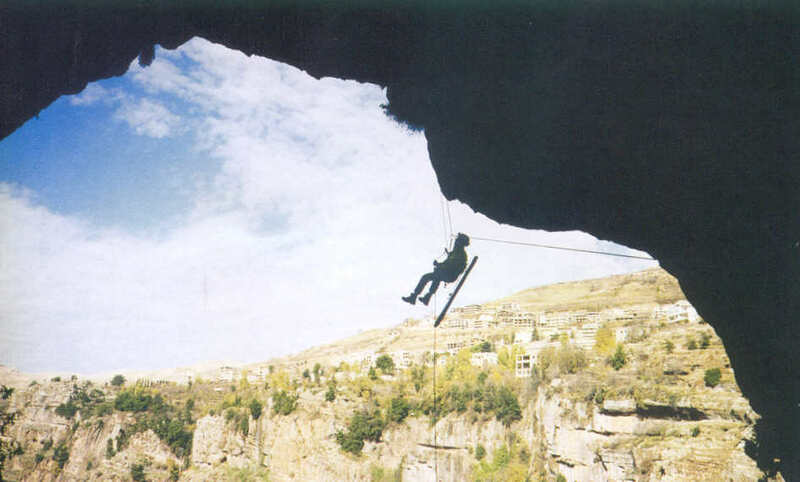 Since Steve, one of our caving club members, started working in Lebanon back in 1995, several small-scale expeditions were organized in this fascinating country. We worked there together with local cavers from ALES (Association Libanaise d’Etudes Speleologiques), SCL (Spéléo Club du Liban) and GERSL (Groupe d’Etudes et Recherches Souterraines du Liban), which we updated with the newest techniques during these years. With mountains up to 3000m and 70% of Karst, caves up to –600m and a Mediterranean climate, Lebanon is quite a nice place for caving. We hereby present some (but far from all) of our most interesting results. Behind the squeeze, 530m of very beautiful active passage were found. On top of a red-colored cascade, there are two ways on. The left and narrower gallery leads to an impenetrable sump and a too narrow side passage in which part of the water disappears. 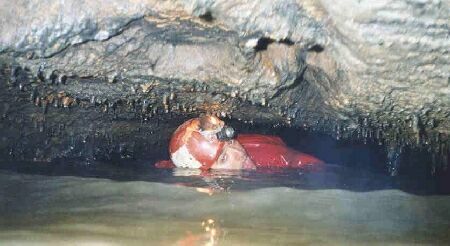 On the right side, the main passage is followed by a wet crawl to end in a large chamber where the water comes out of a two by two meter sump. Here, a narrow and muddy rift with icy draft (Mar Charrière) might bypass the sump, but it requires lots of digging. One year later, September 6, 1997 we are back at the cave for filming (the movie was later on given to the local municipality) and further exploration. The sump was dived by Vincent Coessens and rigged up to an air bell with plenty of formations. It is clear that further exploration of this sump would be very paying and could give clues about the bypass. view, as they did not care about the passage but only about deep water! Together with cavers from GERSL, which have many archeologists amongst their members, we started the descent towards the cave. Hanging on the rope at the cave level (but still some 25m away from it), we got more and more convinced that man piled up those stones. It took us several weeks to make it to the entrance, as the cave had to be approached from the side. Quite a long traversee was rigged, whilst half of Bcharré town was watching from the other side of the canyon (the local priest was praying to God to support the climber). The cave showed several signs of inhabitation; apart from two stonewalls, we found a square basin that was dug out in the floor, and several holes in the walls. 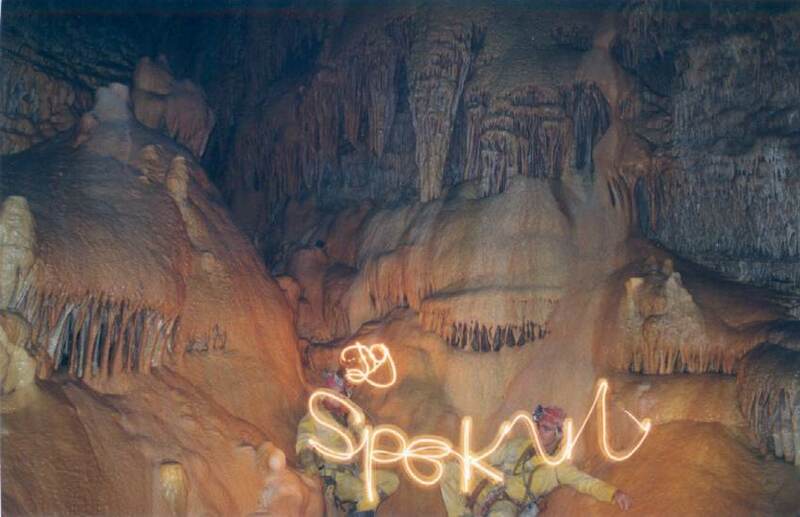 Total development was however very disappointing from speleological point of view. The mystery on how people ever got there without using modern abseil and climbing techniques remains a mystery. When going up he ropes again, National Security, which had been alarmed that we were taking away the gold, awaited us. The only shiny things they found were our survival blankets! The downstream end of Mgharet Ain el Libne, on the Aaqoura plateau, was explored by Lebanese cavers in 1962, one year later the upstream end was discovered (1300m). British cavers visited the cave and partially climbed the cascade at the end of the cave. In 1987 the known parts were mapped by GERSL. The Cascade Terminale, was climbed through a series of chimneys in 1993-94 by ALES to reach a second level. In September 1995, the area above the lake was further explored by Spekul. Using our aluminum scaling pole, we discovered a third and fourth floor (105m above the lake, total development: 460m). During the same trip, another team checked the inlet which fed into the lake; here a wet crawl of about 200m gave way to an active meander, which seemed to go on forever. It was Fadi Baeyno (ALES) who reached the end, a 10m high cascade in 1996. In the summer of that year, Spekul explored higher levels (second and third floor) in the new part, and the whole meander (1.5 km) was surveyed. In the summer of 1997 we managed to get up the 10m cascade, after many hours of climbing and maypoling. Behind the cascade, the right-hand lead was explored for 400m up to a mud sump. The passage on the left, which is more narrow remained unexplored. One year later, the gallery towards the sump was surveyed, the other end was explored for some 40m… to end in another bell-shaped chamber where an 8m cascade came down. This cascade was climbed in 1999, using the maypole as a fishing rod. In front of us, the ever ongoing and narrowing meander, which was followed for some 400m (175m surveyed, with the help of Fadi Nadr (SCL)). We stopped at a 2m cascade, which will probably be climbed later on this year. The cave is now both Lebanon’s third longest and deepest cave, with a total surveyed length of 4093m, and a denivelation of 212m. Mgharet Merheb is another cave on the Aaqoura plateau. It was explored over more than 100m by local villagers up to a 7m pitch that gave into the active level. It was explored and mapped (302m) by GERSL in 1989. They ended in a large chamber with a lake below a 25m cascade. Hoping to find the same kinds of galleries as in the nearby cave of Ain el Libne (this cave develops in the same kind of limestone) we attempted to climb this cascade. A lot of effort and adrenaline was put in this undertaking. It took us three days to reach the top of the cascade and another day to get on top of the pitch above it, from which a 50m free hang can be rigged. Unfortunately, the active part gets too narrow very soon, where the water comes out of a small hole. An attempt was made to find a high level bypass. This led to the discovery of a very beautiful fossil meander with some remarkable formations, which again ended after some 70m. The survey however shows that both levels are superimposed; a more thorough search or even a dig might lead back into the active level. Blasting remains an option in the active part. Climbing the pitch in Mgharet Merheb is probably one of the most spectacular climbs ever undertaken in Lebanon. This resurgence, used as drinking water supply, was explored for 40m by SCL in 1986 and ALES in 1993. Both teams abandoned exploration of this narrow and lowering water passage, due to lack of wetsuits. and 6m high chamber is reached, filled with large blocks. Further on, the right side of a beautifully decorated junction terminates after about 35m, where the roof meets the bottom. The left side again leads to a widening passage, where an alternation of 5cm strata (clay and limestone) can be admired on the right. A fossil passage the leads to a lake below a 4m cascade. At this point, there is about 400m of limestone above us! One week later we return to the cave, together with Fadi Baeyno (ALES). Using far Western techniques and the support of all gods of the 16 different official Lebanese religions, we managed to climb the cascade. The meander behind it, unfortunately gets too narrow after 15 meters. 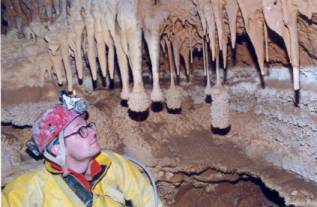 The cave was mapped by ALES in early 1996. They measured 725m of development. The highest point on top of the cascade lies 32m above the entrance level. ALES, 1996. Speleorient 1. 96p. COESSENS, VINCENT. 1997. Libanon 1996-1997, het vervolg van de Spekul exploraties. Spelerpes nr 83: 10-20. COESSENS, VINCENT. 1998. Expés Spekul 96-97 au Liban. Regards nr 31 : 2-10. COESSENS, VINCENT. 2000. 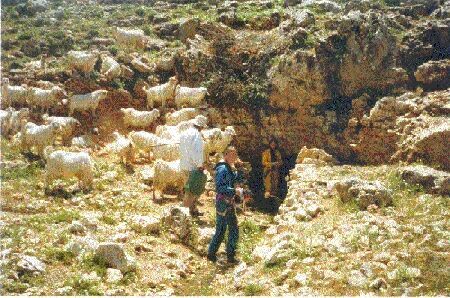 Libanon 1999, exploraties op het Aaqoura en Tannourine Plateau. Spelerpes nr 89 : 50-55. GERSL. 1988. Liban Souterrain nr 1. 51p. GERSL. 1991. Liban Souterrain nr 3. 82p. GERSL 1998. Liban Souterrain nr 5. 380p. SCL 1999. Al Ouat’Ouate nr 11. 138p. SMEYERS, STEVE. 1996. Grotten in Libanon, verslag van de Spekul exploraties. Spelerpes nr 79: 3-11.